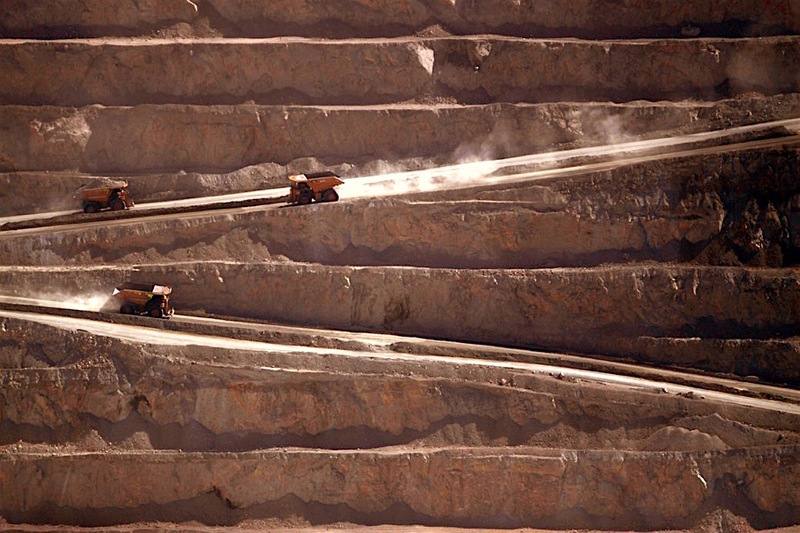 Wood Mackenzie sees copper demand increasing significatively over global supply in the next decade and, together with it, miners’ need for reliable sources of water. “As constant and high demand for copper leads to resources running out, copper grades will progressively diminish. As a result, water demand will increase because it will be necessary to process more material to obtain the same amount of copper,” the consultancy group wrote in a report made public this week. Aware of this, some miners with projects in Chile are already taking steps to guarantee the continuity of their operations. In the document titled The awakening of a dormant challenge: water management in the copper-mining industry, Wood Mackenzie says that companies in the world’s top copper producer are starting to minimise their use of underground and surface water, and are gradually increasing their use of seawater and recirculated water. Rivers, lakes, wetlands, and wells still provide 78 per cent of the water consumed by the mining industry, while seawater and recirculated water account for 15 per cent. However, according to the consultancy, the latter have seen considerable usage increases in recent years, with seawater usage growing by 250 per cent and recirculated water usage rising by 125 per cent. 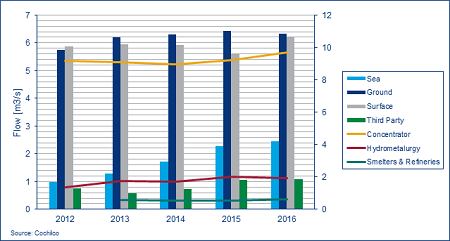 Water consumption according to source and process (only surface water) 2012-2016. Source Cochilco and Wood Mackenzie. Moving into this ‘new’ path has resulted in energy savings for many. “The operational cost is closely intertwined with the energy cost because not only it is necessary to consider the cost of water treatment but also its transportation to the operation site. On average, the cost of treating 1 m3 of water is around US$0.8. Taking into account water recirculation, the need for fresh water is roughly 0.35 m3/t ore and it must be transported between 100 and 200 kilometres and elevated between 1,000 and 4,000 metres at an average total cost of US$3-5/m3,” the report states. In terms of capital expenditure, Wood Mackenzie says Chile’s examples have shown that desalination plants from seawater or brackish water have large operational and maintenance costs, but lower costs in terms of piping installation and fluid transport. Elevation plants that pump untreated water straight from the source to the operation site, on the other hand, have lower operational costs but higher capital costs, especially in terms of transport and piping installation. Beyond the dollar figures, Wood Mackenzie found that mining companies have seen a major gain by tapping into seawater and recirculated water: social and political validation. “Companies such as Anglo American and BHP have previously shared the investment costs of desalination plants with the local community and the government. This has minimised their expenses, guaranteeing supply to the surrounding population and achieving a collaborative solution, such as coordinated and shared water monitoring and reporting,” the research firm says.